Samuel and crew celebrating his 11th birthday. Remember your child’s first birthday? It’s more of a celebration of surviving the first year of parenting, and the kid has no clue what’s happening. From there, you start figuring out what your kid loves and how you can thrill them and their buddies on each birthday. At some point, depending on your kids and your budget, you either give up on birthday parties altogether or bribe them with money instead of parties. Teenage boy birthdays are a fun part of this new season of my parenting adventure. 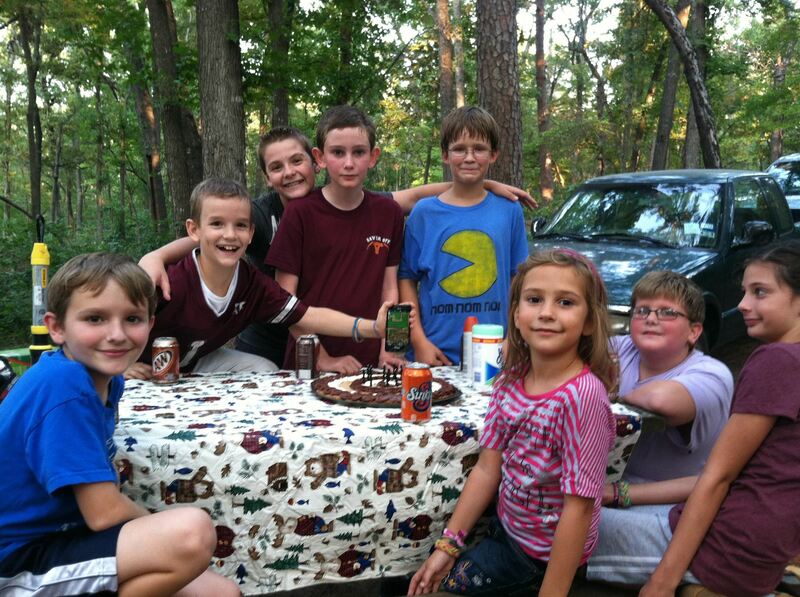 For the last at least five years, Samuel has had a camp out with a few friends to celebrate his birthday. We’ve done this at a nearby state park or sometimes on the land by our house. He is a boy of tradition, so there is no reason to even discuss with him doing anything different for his birthday. But even the camp out is evolving as the boys grow up. For a couple of years, the girls and I would come along so that I could help organize the activities, bring fun things and make sure the party had all the components of a birthday. Last year they camped at our house, and I had to be much less involved in what went on. This year, though, felt drastically different. I ran through Walmart in about 10 minutes and bought everything we needed for this party. Basically, food. For the first time ever, I bought a store-bought birthday cookie cake. This admission is still hard for me, and should definitely have been included in 11 Ways I Lowered My Parenting Standards. Nathan told me he was taking the boys far out in the woods to set up a tent. He debated whether he needed to sleep out there with them. We decided this year to let them sleep on their own. Nathan insisted on taking all the food out to where they were and not bringing the boys up by the house. There were no plates. They were no “Happy Birthday” napkins. There was no hand sanitizer. There were just hot dogs, chips, s’mores and lots of soft drinks out in the woods. The sisters went down with Nathan to supervise the cookout, and Nathan said he’d come back for me. (He couldn’t take us all and the stuff at once.) But then I just never joined them. I let them roast their hot dogs and have their s’mores by the campfire without me. Basically, I wasn’t needed at my son’s birthday party. And I was okay with that. I did insist that there would be cookie cake and candles and singing, and that I would witness it. I asked Nathan to come get me before “bedtime” for that part. The boys literally didn’t want to come out of the tent to even acknowledge our presence for this party. Nathan forced them all out of the tent for me and said basically “You’ll sing, and you’ll like it.” I’ll never forget the joy that surprised me in that moment. I was sitting on the four-wheeler in the pitch black holding in my lap the store-bought cookie cake with 14 glowing candles that I’d scribbled Samuel’s name on. Of course the sloppy icing writing wouldn’t have mattered to them in the daylight, but it certainly wasn’t bothering anyone in the dark. Nathan and the girls and those boys we’d forced to gathered stood around me and the glowing cookie cake and sang “Happy Birthday” to our boy. The day before I’d counted out those 14 candles and my heart felt a little extra heavy, because at some moments their growing up just stings a little. 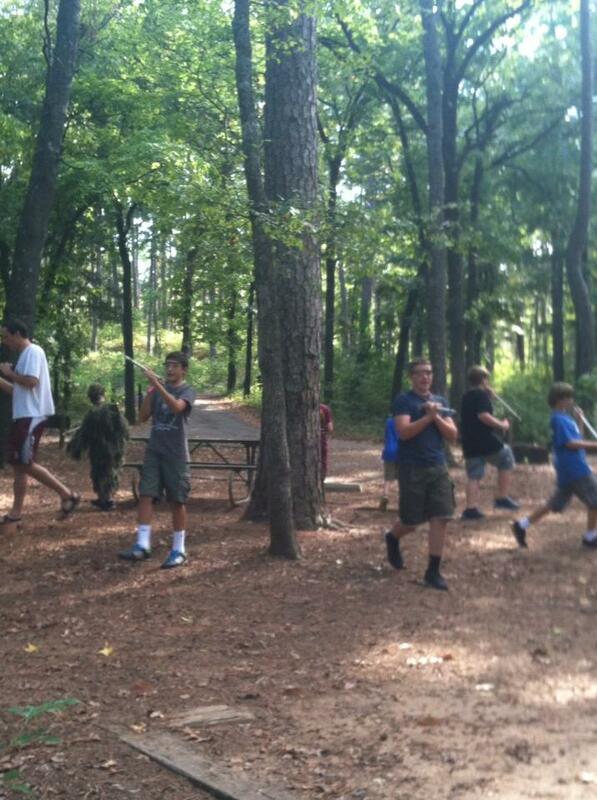 When did the Diego scavenger hunt in the park get replaced with teenage boys traipsing through the woods unsupervised? When did I become okay with switching out fancy homemade birthday cakes for store-bought whatever? We’ve jumped from thematic hand-made invitations to group texts. Instead of playing on the playground, they chop down trees with axes “for fun”. And they still love every minute. And this is why I know it’s okay. My heart was so happy leaving those boys in the woods to do their own crazy things. On birthdays, as a mother, I want to see my kids smile and know they feel special, celebrated and understood. The parties and ways of celebrating will continue to change, but I found the same feelings of joy and satisfaction in leaving them in the woods as I did in the Diego scavenger hunt. Jacob has always loved Sam’s birthday parties, especially the Diego Scavenger Hunt you mentioned here. Happy Birthday Samuel Payne! You are a very special boy, from a very special family! May your 14th year be just a bit more fascinating, challenging, fun, scary, and filled with love and laughter than the last (insert smiley face emoji)!